There is an awkwardly large 725g box of cornflakes sitting in my cupboard left over from the Lemon Cornflake Coconut Cups. I could make more of them, but I’m 3 batches down already and it’s time to try something new. 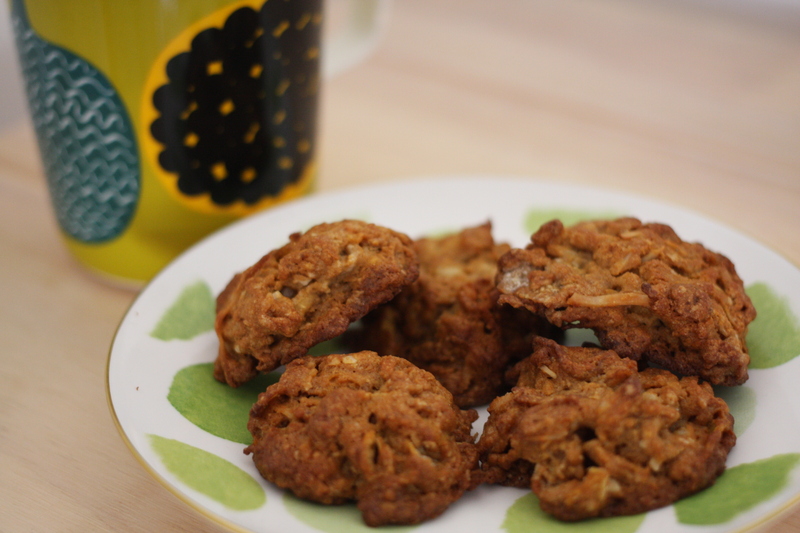 Cornflakes are a fairly regular feature in the recipes in Nana’s books, but today is a day for something simple. Today is a no beating, no creaming, no scales day. 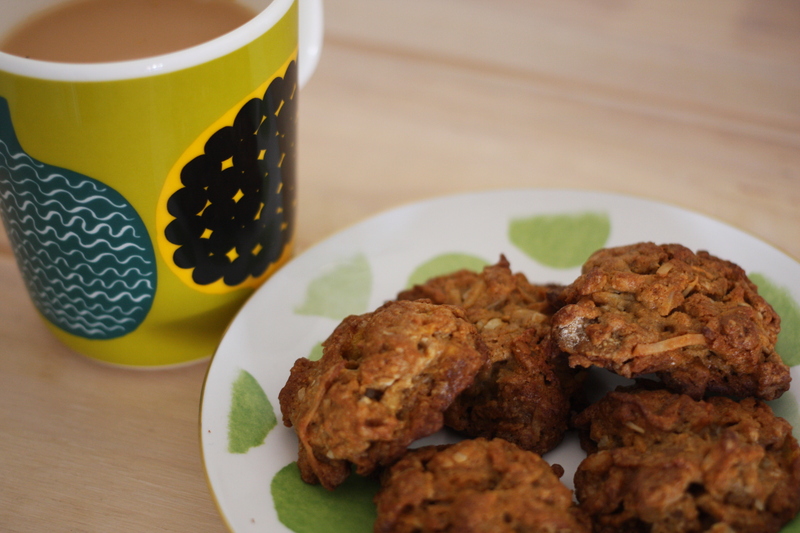 Today is a cornflake biscuits day. 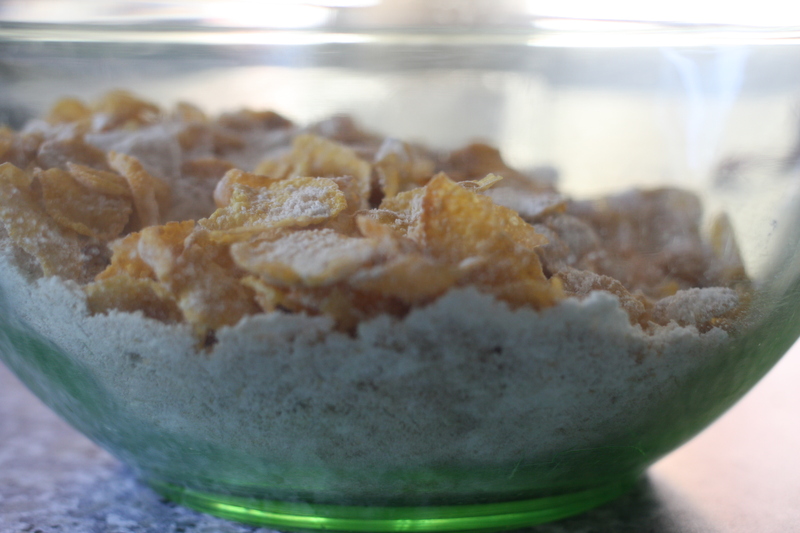 Mix the sifted flour with the cornflakes, coconut and brown sugar. 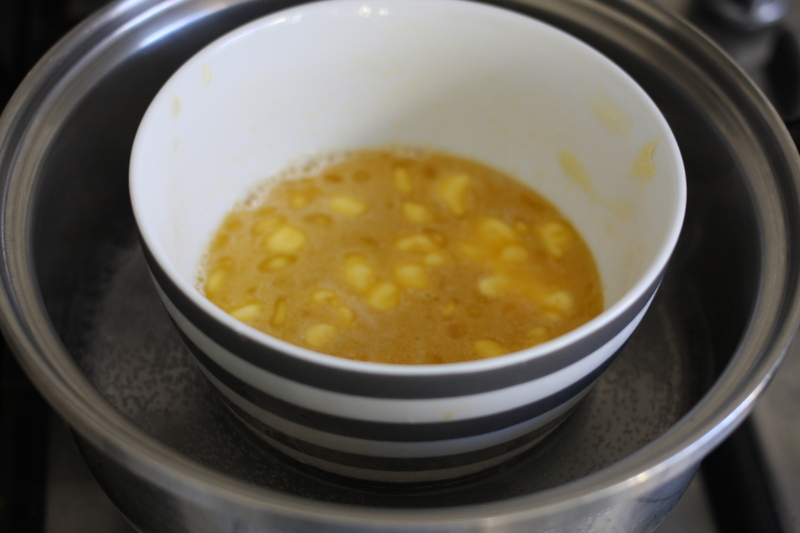 Dissolve the butter, treacle/golden syrup and bi-carb soda in the hot water – and enjoy that satisfying hiss. My butter refused to dissolve in this, so I simmered a little water in a pan and put my bowl over it until it melted. If you have a microwave you could probably pop it in there for a few seconds. Combine the two mixtures. Bake in small heaps (mine where a heaped tablespoon) in a slow to moderate oven for 20-30 minutes until firm and crisp. I missed the word slow and put mine on at 180 degrees. I got quite a shock when 15 minutes later the top rack were looking fairly dark – luckily I had put some in on the bottom rack a few minutes after. 180 degrees is a little high people, go for 160 degrees instead. These felt like ANZAC biscuits for kids. They had a beautiful crunch. Perfect with a cup of tea. This entry was posted in Cakes and Slices and tagged biscuits, Food, simple. Bookmark the permalink.